Substandard conditions in the aftermath of Hurricane Harvey have impacted workers’ health and safety on the job, as well as their wages according to a devastating new report from from the National Day Laborer Organizing Network (NDLON) and University of Illinois Chicago that surveyed 360 workers. The report also offers recommendations for improving working conditions during post-disaster recovery operations. These hazards are compounded by long work hours, the rapid pace of work and the unknown dangers of the specific hazards at any given worksite. Hurricanes and other disasters present a major challenge for OSHA and other local and national government agencies dedicated to protecting workers during recovery operations. Second responders are not receiving the training they need to protect themselves from hazards during post-disaster recovery. Eighty-five percent of day laborers who have worked in hurricane-affected areas report that they have not received any training for the worksites they are entering. Similarly, 87 percent have not been informed about risks related to unsafe buildings, 85 percent have not been informed about risks related to mold, 85 percent have not been informed of risks of working in contaminated water, and 83 percent have not received training for working around fallen trees or electrical lines. Most day laborers do not have the personal protective equipment they need. Nearly one-third (32%) do not have work gloves, 40 percent do not have protective eyewear, 41 percent do not have steel-toed boots, 61 percent do not have a respirator, and 64 percent do not have a hard hat. More than one-third (34%) of workers reported having been injured while employed as a day laborer in Houston. Most injuries were related to puncture wounds, ergonomic hazards, falls and broken bones. In addition, twenty-seven percent report difficulty breathing, 28 percent skin rashes and swelling, 35 percent report recurring headaches, and 40 percent report watery eyes or eye infection. Of those who suffered an injury, 67 percent indicated that the workplace was unsafe, 63 percent said that the injury was due to lack of protective equipment, and 52 percent said that they were injured due to pressure to work faster. Compounding the health and safety, and wage and hour problems, “nearly two-thirds (64%) of the day laborers who identified themselves as being undocumented immigrants indicated that they do not feel safe asking for help from government officials.” There are an estimated 575,000 undocumented immigrants in the Houston area and 72 percent of day laborers in the area are undocumented. And even if they were comfortable approaching government officials for help, very few workers even knew what agencies to approach. Develop Worker Centers as “Disaster Recovery Hubs” so that day labor worker centers, labor unions, and other organizations that directly engage informally employed workers are prepared to equip second responders with personal protective equipment and provide health and safety training. Provide increased budgets and dedicated investigators for local agencies that who visit informal hiring sites and worksites where day laborers are employed. A recent Associated Press article about day laborers in Houston described the conditions that the day laborers work under and how many of them are unaccustomed to construction work and have come in from other areas. An article by Think Progress describes the other problems facing undocumented workers in the Houston area. OSHA responds by moving staff into the affected region from other parts of the country. But that’s expensive, and OSHA rarely is provided with additional funding to address natural disasters. OSHA has also worked closely with local worker centers and labor unions who provide advice and services for day laborers. After Sandy, which hit the New York and New Jersey region in 2013, some of the worker centers had already received Susan Harwood Training grants, ensuring that many day laborers already had training. OSHA also worked with a number of public health organizations and equipment manufacturers to ensure that adequate personal protective equipment was available. And Congress, as part of the Disaster Relief Appropriations Act of 2013, provided an additional $1.2 million to provide funding to worker centers focusing on Sandy recovery. There is no excuse to not be prepared to protect the workers that help rebuild peoples homes — and their lives — after a disaster. If federal agencies like OSHA can expect to see devastating natural disaster on a regular basis, provisions need to be made for a permanent emergency fund that the agency can draw on to ramp up worker protection activities after a disaster without seriously impacting the annual budget. 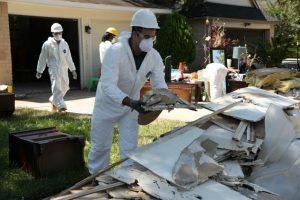 More training money should be made available under the Susan Harwood Training Grant program to ensure that worker centers, unions and other non-profit in hurricane-prone areas have been able to train large numbers of day laborers before disaster strikes. And provision should be made for emergency supplemental grant funding to provide training for long periods after the disaster hits. Federal OSHA needs to work more closely with FEMA and local emergency response authorities to pre-coordinate actions to protect workers during recovery operations and arrange for local authorities to make referrals to federal or state OSHAs when unsafe conditions are observed. In addition to suspending immigration enforcement, efforts should be made to inform undocumented workers that OSHA will enforce safe working conditions regardless of a worker’s immigration status. We have now had the benefit of learning the lessons from disasters like 9/11, Katrina, Sandy and now Harvey. Protecting clean-up workers after the Deepwater Horizon oil spill also provided valuable emergency response lesson for OSHA and other federal agencies. We know what we have to do, and we know that we can expect to experience many more, and more frequent extreme weather events in the future. There is no excuse to not be prepared to protect the workers that help rebuild peoples homes — and their lives — after a disaster. Next Post Next post: OSHA Enforcement Update: Large Cases, More Press Releases.